Which One Doesn't Belong? Many of us have played with puzzles like that since we were very young. Most of those puzzles had one right answer. Christopher Danielson has been championing versions of this where every item could be the right answer. He's created a 16-page shapes book for young children, built on this principle. And he recently took it out to classrooms around Minneapolis, learning much about kids' understandings of shape. Sam Shah posted his list here. I loved his list, but wanted to rewrite it a bit for myself. (Also, Sam finds it more effective to review the algebra ahead of time, while I think it's more effective to review once we see the need in our exploration of calculus.) I am posting this now, so it's available as an answer to this question on math educators stack exchange. Unit 1 includes history, graphing functions, slopes of tangent lines by approximation, algebraically finding the derivative using the limit (which we do not carefully define yet), seeing the similarities between velocity, rate of change, and slope, average versus instantaneous velocity, derivative from a graph, (estimated) derivative from a table of values. Unit 2 includes derivative properties needed for polynomials, graphing, limits and continuity, trig derivatives, and optimization. Unit 3 includes chain rule, derivatives of exponential functions, implicit differentiation, derivatives of inverse functions (ln x, tan-1x), and related rates. Unit 4 includes integration (finding area under the curve), anti-derivatives, fundamental theorem of calculus, and substitution method. If there is time we include volumes of rotation (which I think is a perfect ending for the course). Simplify complex fractions (to find the derivative of the 1/x function). Apply the formal definition of the derivative to simple polynomials and to simple square root functions. Accurately graph y = sin x and y = cos x. Follow complicated logic (in the definition of limit). Be able to graph exponential and logarithmic functions. Think in terms of composition of functions to determine outer and inner functions, in order to use the chain rule. 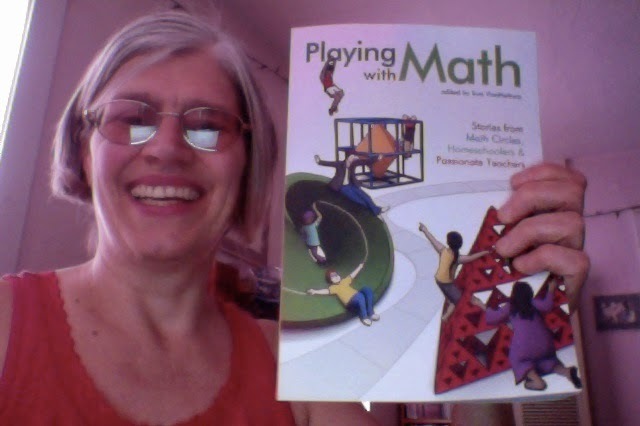 At 3:30 this afternoon, UPS knocked on the door and delivered copy number one of Playing with Math: Stories from Math Circles, Homeschoolers, and Passionate Teachers! If you haven't ordered your copy yet, you still can.